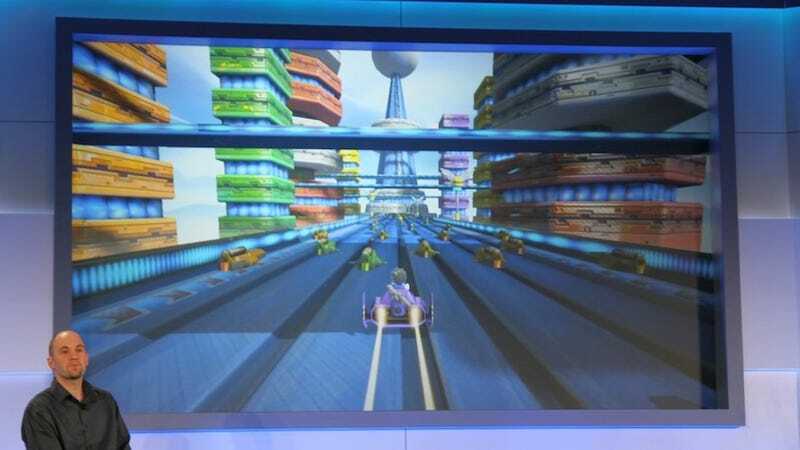 There is some sort of Z-Fero style racing game, Nintendo producer Katsuya Eguchi showed today during an after-hours E3 showcase of the Wii U's launch game. It's not clear how fleshed-out the racing game is. We were shown a brief clip of a Mii character finding a signature F-Zero ship in the game's Nintendo-item-filled hub world. ANd from there we saw a race... possibly single-player against other characters, running at a fast framerate, mixing in jumps and turns. It wasn't deep, but it's the first official acknowledgement by Nintendo of the F-Zero franchise in many years.